Recently while chatting on the phone with Dr. Tetlow, I mentioned that I was just wrapping up steaming milk for my morning latte. I have a daily ritual of making an espresso drink since my husband bought me a Breville Barista Express espresso machine as a holiday gift. 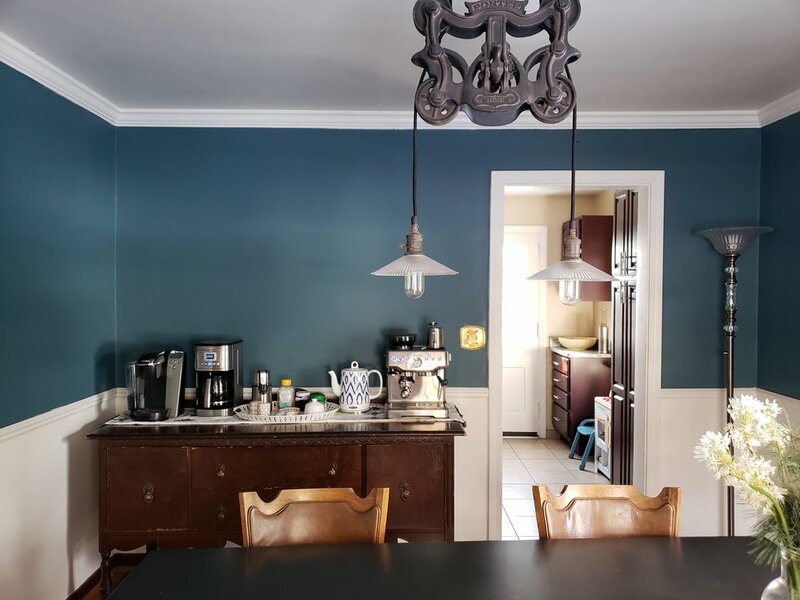 I have a coffee and tea bar in my dining room to create more social atmosphere when we have guests over in the spirit of breaking bread. I love coffee and it's important to know what's in our food. I try to make the vast majority of my food (and drinks) and home from scratch. There's a reason you see all those coffee memes floating around the internet with jokes like, "How do you feel when there is no coffee? Depresso." Coffee increases dopamine which gives you an overall sense of well-being. Caffeine can help if you have low dopamine levels. Dopamine is a neurotransmitter that activates pleasure in certain parts of the brain. Dopamine plays a critical role in emotional and mental health. It is important for emotion, cognition, food intake, endocrine regulation, and several other vital bodily functions. Low dopamine levels have various symptoms including decreased motivation, altered sleep patterns, and fatigue. Caffeine produces increased concentrations of dopamine in your brain synapses. It manipulates dopamine levels by slowing down the rate of dopamine reabsorption which creates a positive mood. It also blocks adenosine reception so you feel alert and injects adrenaline into the system to give you a boost. Remember everything in moderation. Too much caffeine can cause you to crash and result in adrenal fatigue. Many sources of caffeine are also paired with sugar which should always be limited. It takes will power to limit myself to 2 coffee drinks per day although Dr. Tetlow usually recommends one or sometimes less. For reference, there is 64 mg of caffeine in a shot (1 fl oz) of espresso and 95 mg in 8 fl oz of coffee. Instead of dairy and sugar, I opt for unsweetened plant-based milks in my coffee drinks which I make at home using my Almond Cow. To make the milk, I soak 1/2 cup of nuts or seeds for 4 hours or more. Spices can be added for more flavor. I sometimes look up milk recipes at https://almondcow.co/blogs/milk-recipes. I add more water and turn on my Almond Cow - 30 seconds later I have a liter of plant-based milk. Making your own milk is not only healthy, it's eco-friendly. My go-to coffee drink to make with this milk is a latte topped with cinnamon which has 60 ml espresso, 300 ml steamed milk, and 2 ml foamed milk. Here are a few of my other favorite coffee drinks to whip up. On occasion when you're feeling indulgent - Affogato - 60 ml espresso, 90 ml traditionally made with vanilla ice cream, but I enjoy it with chocolate cashew ice cream. Wondering how your dopamine levels measure up? We can help. Schedule an appointment with our cognition expert, Annmarie McManus, MMSc, PA-C, PT, IFMCP, and request a Genecept Assay test. PIM wants to hear from you! Do you have an experience with espresso? Do you find this article helpful? Share your thoughts in the comments below!